It won’t come as a surprise to many leaders, but change is hard. And the greater the change – the greater the shift in thinking or habits – the harder it is. The wonder is, given the difficulty, that people ever change their minds on important things. But they do. My theory, which I call the drip-drip-drip theory, is that it begins with doubts – things that can’t be easily reconciled with a person’s present views. As the doubts mount (drip, drip, drip), the person struggles more and more to reconcile them, until suddenly she shifts, sometimes reversing long-held beliefs. This is how Democrats become Republicans and vice versa. The declaration (“I’ll never vote for another Democrat!”) comes overnight, but it’s usually preceded by a steady stream of doubts (drip, drip, drip). But there are things that can help people take that final step in accepting a new idea. One of the most effective is the entry of a champion – a respected person who has accepted the new idea and can vouch that it is reasonable and worthy of support. Second, timing is everything. Champions are second-stage leaders who enter when an idea is gaining viability. Their role is to move the idea from fringe to mainstream. Enter the discussion too soon, and they lose credibility; too late and they’re seen as irrelevant. So who are the best champions? Really, there are only two criteria: That they be well known and credible. They could be elected officials, corporate CEOs or former leaders who remain known and respected. Perhaps the easiest way of thinking about champions is to look at one we’re all familiar with, former Vice President Al Gore and his role in the climate change debate. Believe it or not, Gore didn’t discover that earth’s climate was changing; it just seems that way. By 2006 when his documentary “An Inconvenient Truth” was released, scientists had been talking about climate change for decades. (Gore said he learned about it in college in the 1960s.) But because of Gore’s familiarity and credibility, he was able almost overnight to shift the discussion from classrooms and laboratories to dinner tables and legislative chambers. 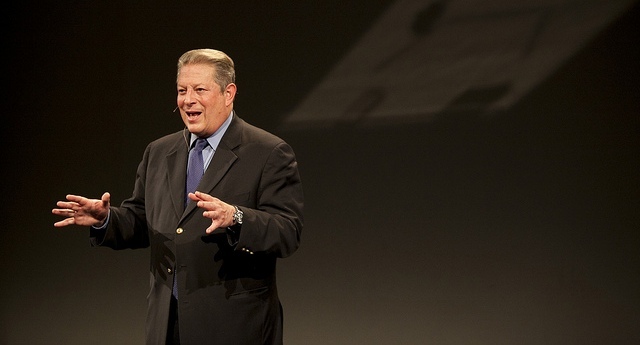 Gore gave the climate change debate a human face. That makes some in the environmental community uncomfortable; they think Gore is too identified with their cause. (How often do people say sarcastically during a cold snap, “Hey, Al Gore, is it cold enough for you?”) But that instant identification illustrates why champions are so important. Activists understand the complicated ideas they are advancing; most people don’t. They rely on people they respect to assure them that the ideas are sound, that the sacrifices are worthwhile. Few of us can explain the physics behind climate change, but we believe Al Gore understands it and that gives us greater faith – or higher blood pressure, depending on what you think of him. There’s another role that champions can play, and that is defending the ideas when they come under attack. You can see Al Gore playing this role, too. When opponents attacked the credibility of climate change scientists not long ago, Gore weighed in with an op-ed article in the New York Times refocusing the discussion on the overwhelming scientific consensus behind climate change. In the long march of ideas in your community, there will be opportunities for champions to play both roles: vouching for new ways of thinking and new courses of action – and defending the ideas when they run into trouble. Photo by Recylebank licensed under Creative Commons.